I was off the bike for over a week, which ordinarily would make me lose my mind, but I spent this past week on foot, hiking around Glacier National Park, earning my Junior Ranger badge and feeling positively dwarfed by mountains and lakes and meadows and streams and all of that. No pictures could capture the scale of that place, and it has to be done on foot–one road through the park, and no mountain biking, so if you want to see the sights, you’ve got to use your feet (though all the people biking that one road over the Continental Divide impressed me and made me mad jealous–no reason not to bike/hike the place!). And then I flew home and the mountains were gone, but home was here. Sunday’s bike ride was a short one, but it felt good to just spin a little. S. and I rolled down the hill to Artscape where we pushed through crowds, waited in lines, listened to music, and waited in lines to walk through popup art installations, and then we rode the Ferris wheel. 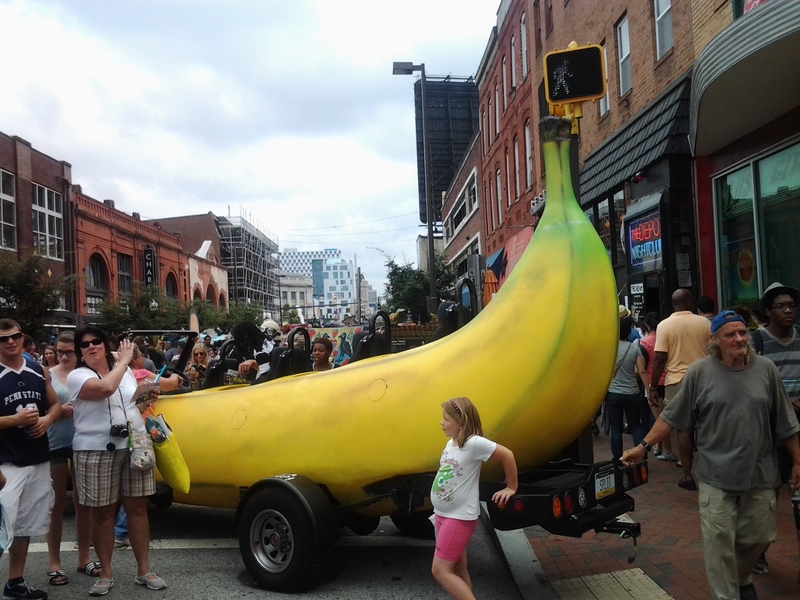 I snapped this picture of the banana car in the art car displays on the upper section of Charles. Folks were taking turns climbing in and having their pictures taken as we are all a part of that particular tiny subculture for this weekend. The day ended with an absolutely perfect show that made me oh-so-homesick, and then a quick ride back up the hill to home for grilled cheese sandwiches and tomato soup. It was a wonderful vacation, but it is also good to be home. This entry was posted in festivals and tagged art cars, Artscape, Baltimore, Mt. Vernon. Bookmark the permalink.